We were about a fortnight into our second term at prep school when a new boy with the unusual name of Carmichael Theobald arrived in our dormitory. I forget now why he was allowed to arrive so late. It must have been a severe illness or some sort of family bereavement: no other excuses would have been accepted. Heaven knows who or what had been threatening him, but, quite clearly, his plea never fell on deaf ears: within a couple of minutes, Tintin would have come to his rescue, and Carmichael Theobald would be fast sleep, leaving the rest of us wide awake, speech bubbles with ‘!! !’ and ‘?? ?’ tethered to our eight-year-old heads. Eight-year-olds are no strangers to the joy of teasing. But none of us teased Theobald about his midnight screams, presumably because we recognised the sense in his choice of Tintin as his saviour. Though ours was a Catholic prep school, few off us would have wanted to ask Jesus to save us from, say, falling off a rope into a waterfall while being chased by baddies. He would have made too much of a song-and-dance about it, and would have ended up by delivering a knowing little homily. He might even have embarrassed us by inviting his disciples along to watch. But, more than anyone else in the world, you could always rely on Tintin to get you out of a scrape with the minimum of fuss. Tintin was amiable, intrepid, good-humoured, quick-thinking and, perhaps above all, straightforward. The Crab with the Golden Claws, Red Rackham’s Treasure, Prisoners of the Moon, The Seven Crystal Balls: all of us had read, and re-read, and re-re-read all the Tintin books. Our real-life parents might drop us off at school at the beginning of each term and not see us again until half-term, but Tintin and Captain Haddock would be there for us every day, our refuge and salvation from irate Latin masters and freezing football pitches and muscle-bound matrons. Without getting too Freudian about it, I suppose that Tintin was our mother, loving and clean-shaven, while Captain Haddock was our father, crankier, more crotchety (‘Billions of Blue Blistering Barnacles!’) and a great deal more hirsute. 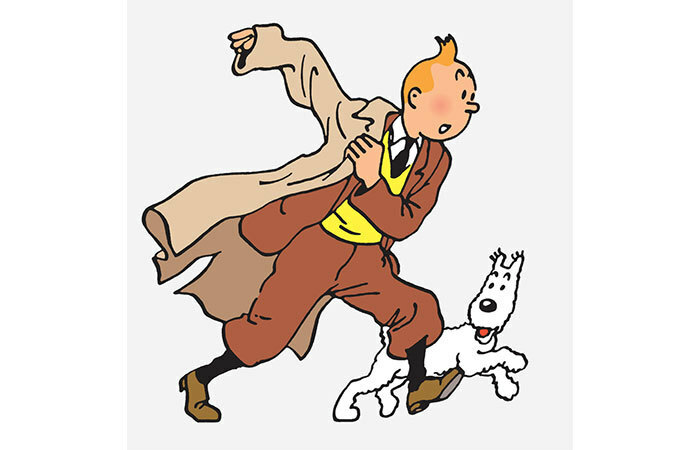 Tintin’s creator, Hergé, came to feel that his need to escape the drab straitjacket of Catholic Belgium was what had originally driven him to create the world of Tintin. Half-man, half-boy, a reporter untroubled by the burden of reporting, Tintin travels the world – Peru, the Congo, Scotland, America, even the Moon – and is always guaranteed the most exciting and colourful of adventures. And what colours! They dance off the page: the bright blue of Tintin’s jersey, the contrasting greens of the jungle, the rich yellows and reds of the native robes. Of course, as children, we read Tintin for the adventures, desperate to find out what happens next, but the richness of the colours and the beautiful clarity of the drawings must have contributed to their subliminal appeal. Hergé was painstaking in his art, but, like all the best artists, took every effort to make it seem effortless. By the time he came to create his 18th Tintin adventure, The Calculus Affair, in 1954, he was insistent that every object and setting be drawn from life. This meant that he went with his camera and sketchbook to Switzerland to record Cointrin Airport, Cornavin Hotel, Cornavin Station, and to Nyon for Professor Topolino’s house. For one page, in which the baddies force Tintin’s taxi into Lake Geneva, Hergé scoured the lakeside road just to find the one corner at Trevon where the incident could occur. Over the years, Hergé became, to some extent, a victim of his own obsession. After hundreds of letters from Tintin fans were posted to Professor Calculus in Room 122 on the fourth floor of the Cornavin Hotel, the management sent Hergé a huffy letter pointing out that such a room number did not exist. But in the end, art triumphed over reality, and, when the letters kept coming, the management were obliged to introduce a Room 122 where none had been before. Needless to say, there are adults for whom the adventure and delight of the Tintin books are never quite enough: behind every waterfall and in every crevasse, they search for a symbol of something deeper. One French intellectual, Jean-Marie Apostolidès, has written a number of books – L’Archipel Tintin, Tintin et le Mythe du Surenfant, Dans la Peau de Tintin – in which he attempts to psychoanalyse the key characters. For him, The Calculus Affair represents both Calculus’s ‘triumph and his defeat’, and the scene at the end in which the Professor burns his plans for an ultrasonic weapon represents ‘a symbolic castration’. Another French intellectual, Pierre-Yves Bourdil, published an essay called ‘Tintin: A Myth in This Century’, in which he said of the Tintin oeuvre that, ‘We use it, in a sense, like the Bible’ because it ‘reveals to us the essential’. Tintin himself is, he says, ‘a hero to whom the gods have given a destiny’ and Hergé, ‘through the delicious music of his work, makes us participate in our century’. And so on and so forth: like a latter-day Thompson and Thomson, Apostolidès and Bourdil arrive on the scene as smart, self-important authority figures but, more often than not, end up flat on their faces, their bowler hats hopelessly askew. Hergé travelled to Zurich to visit a psychoanalyst, Franz Riklin, a pupil of Jung, who concluded that the white symbolised his obsessive quest for purity, and advised him that if he didn’t abandon his obsessive work on Tintin it would eventually destroy him. Hergé accepted the analysis, but refused to accept the solution, believing, like his plucky hero, that problems are best confronted head-on. ‘What would Tintin do?’ remains a pretty good question to ask oneself, particularly now that so many former childhood heroes – Rolf Harris, Jimmy Savile, JFK, etc – have taken such a tumble. So instead of retreating into retirement, in 1959 Hergé embarked on what he came to regard as his greatest work, Tintin in Tibet, the pages of which are filled with snow. It is, says Hergé’s sharpest biographer, Harry Thompson, ‘a book of overwhelming whiteness and purity’. Once Hergé had completed his masterpiece, he divorced his wife and married his lover, never again to be visited by one of his snow-white nightmares. Tintin had saved his creator, just as he was to save young Carmichael Theobald, night after night.